Genuine Brother® Accessory. Secure and apply cording in one step. 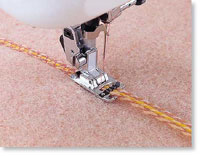 Allows for the insertion of cords held by a notched clip with cords being stitched down using a serpentine zig zag or decorative stitch. Couch multiple threads with zig zag stitches. Flexible grooved securing attachment handles threads of varying thicknesses.